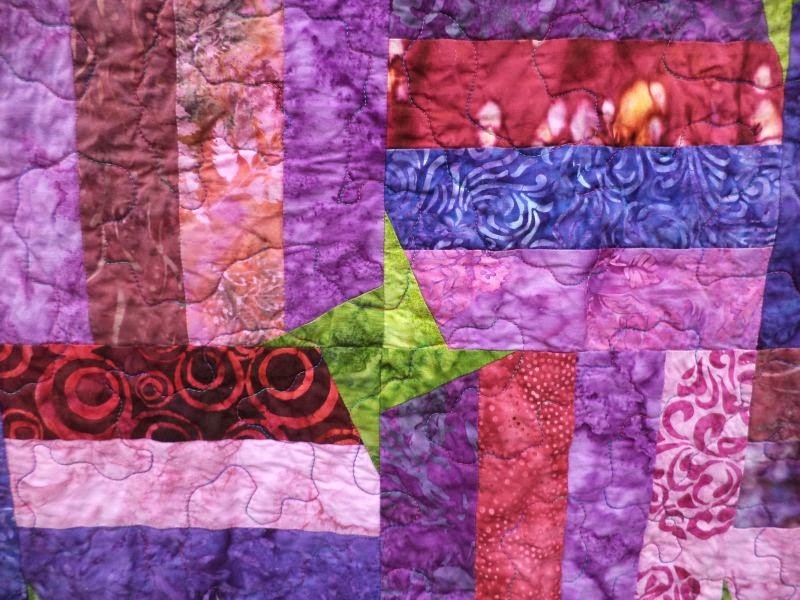 I made another scrap quilt from Judy's batiks. 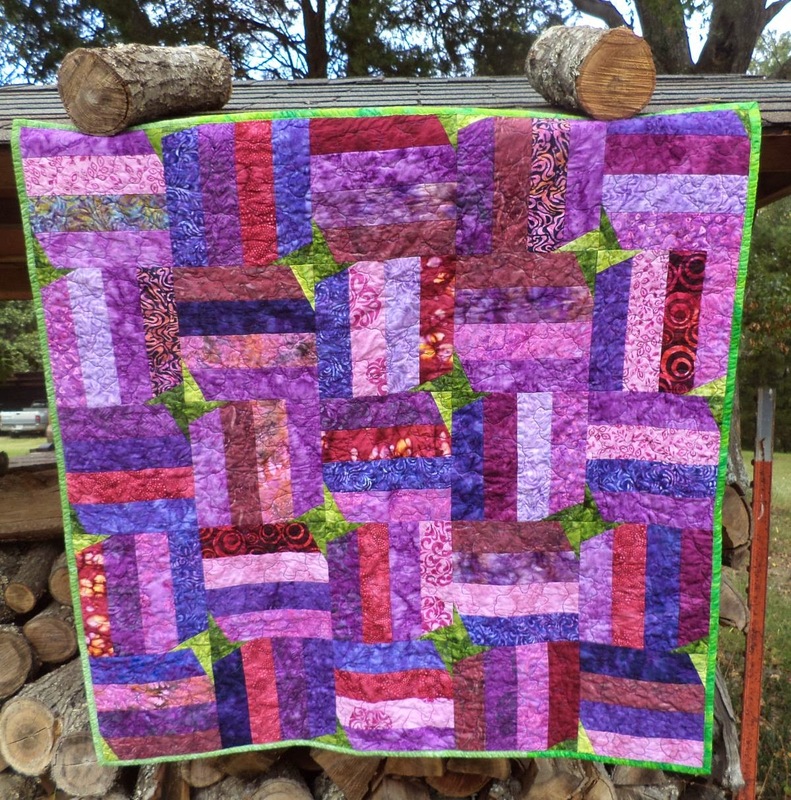 This time a cute little baby quilt in watermelon colors-- pinks, purples, and green. Everything in this quilt is made from 2.5" strips, and I had enough of them to make the quilt 40" square. I know this isn't an original design, I've seen it before, but it is very flexible and versatile. I am going to put a little mini tutorial down at the bottom about how I did it. 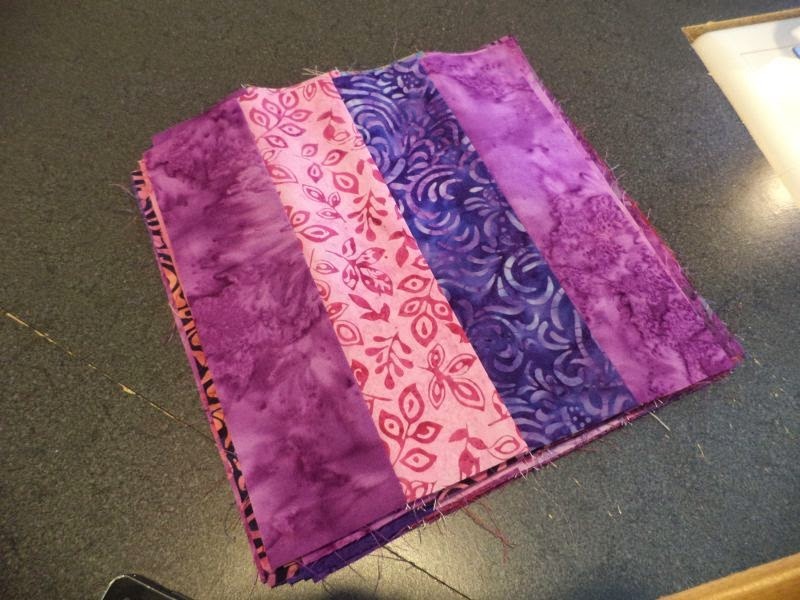 I quilting it with a loose stipple using a variegated pink/purple/teal thread. 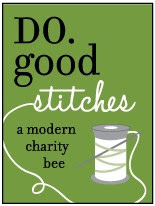 Backed with two cute flannels that came from the remnant bin and bound in more green batik strips. Next you add the pin wheels. The triangles come from rectangles cut on the diagonal. My rectangles were 2"x4" to start with. The longer and skinner your rectangles are the more pointy your pinwheels will be, the more squarish you rectangle, the closer to diamonds/squares on point the pinwheels will be. Attach the triangle to opposite corners. Each block uses a matched set of triangles, ie if you put them back together they would make a rectangle. Sew the block together and voila! 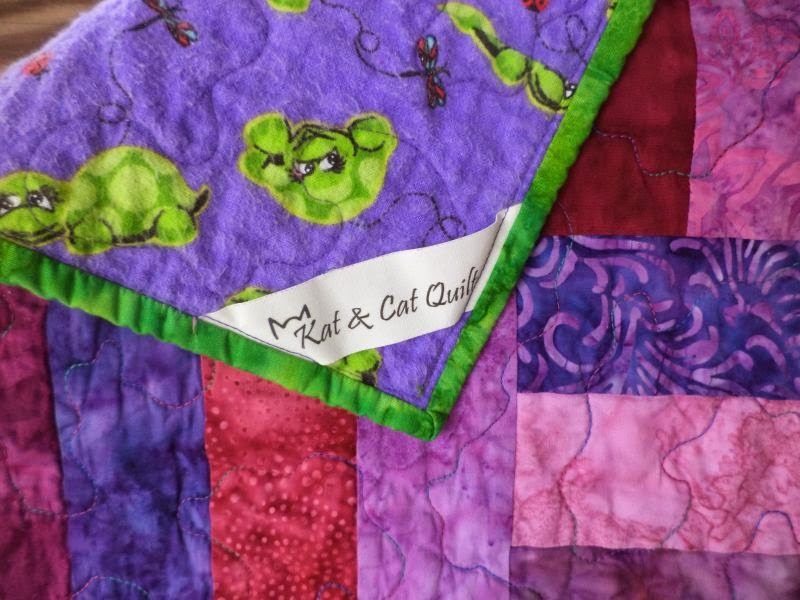 A cute finished baby quilt. Not exactly a complete tut but hopefully it gives you enough to start! Very cute and great way to use scraps. I also like your quilt-holding method!! :) I always have the hardest time getting my quilts up for photographing! Great scrap quilt, I love the green stars. Those little green stars really make the quilt sparkle. Very cute--nice work! I really like those little pinwheels! They'd be a whimsical addition to lots of different block styles. I definitely need to keep that idea in mind. And love the pops of green with the other purple-y colors. I totally love it! 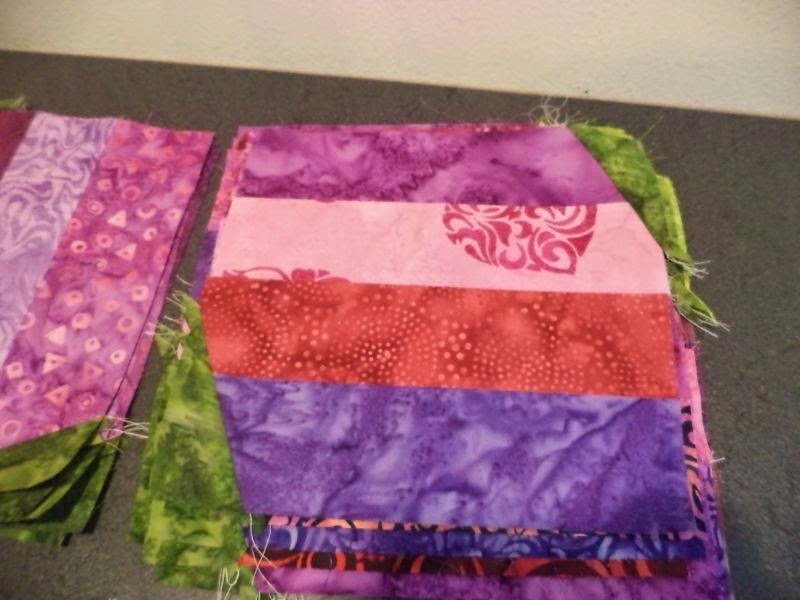 How much fun to use someone else' scraps to make a quilt. 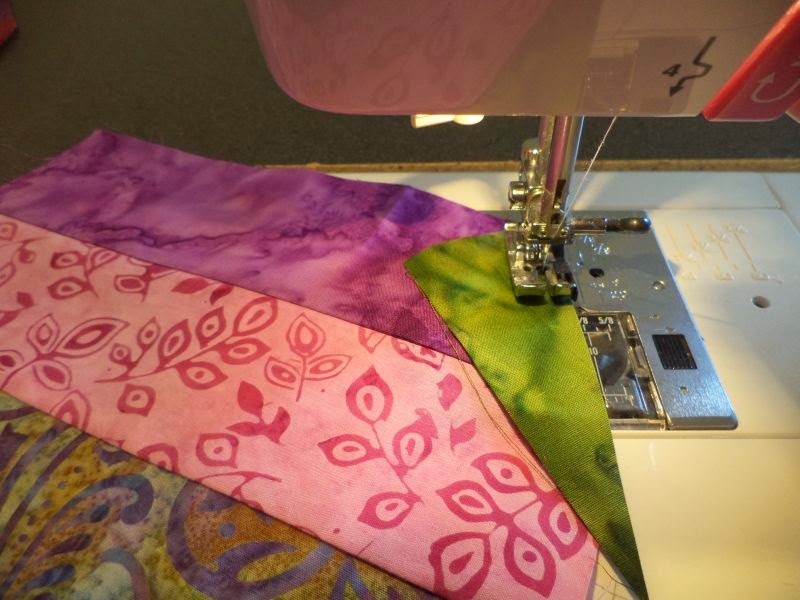 I have given some of my scraps away, and have heard about the finished quilt. So I know how happy Judy must be to see this. This was a beautiful quilt, love the coulors !